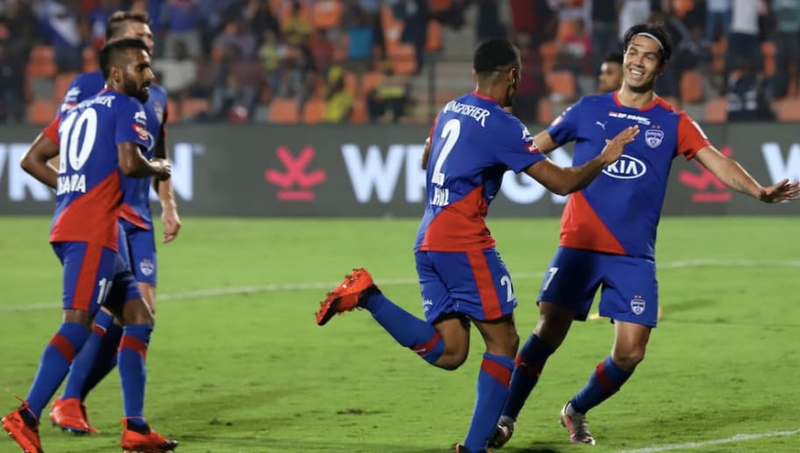 ​Rahul Bheke's 117th minute header meant Bengaluru claimed their first ever Indian Super League trophy in the final against FC Goa in Mumbai on Sunday. Cuadrat opted for a foreigner in midfield as Xisco retains his place and Serran was on the bench. Lobera too fielded a 4-2-3-1 with the only expected change coming round from their last game; Edu Bedia replacing Hugo Boumous behind the ISL golden boot leader Ferran Corominas. The #HeroISLFinal line-ups are OUT! The game started at a very fast pace with both teams trying to build momentum and settle in as soon as they can. Bengaluru got the first big chance of the game just in the sixth minute. Chhetri laid the ball to Miku, who first beat Lenny and went all on past Mourtada Fall inside the box. It looked like he was going to score a solo goal but Naveen came off and grabbed the ball with Miku slightly taking a heavy touch while being one-on-one with the Goa keeper. The rest of the first half saw both teams testing each other on multiple occasions but not being able to put the final touch on their efforts to win the game. ​The second half saw more action as both teams played counter-attacking football. Bengaluru struck the woodwork as Udanta's cross was chested by Chhetri in the 81st minute and the ball fell for Miku after a failed clearance by Fall is tracked forward by Xisco. The Venezuelan hit the far post and Goa lived to see another day with Lenny clearing up the defence. It was all square at full time and the game entered into extra time. The first half of extra-time saw both teams play cautiously. And Bengaluru ensured that they win their first ever Indian Super League trophy in the 116th minute. Rahul Bheke scored from the corner put in by Dimas. The delivery was swinging right into him and his header bumped off the post and went into the net as Bengaluru FC claimed the Indian Super League crown.